Education Department rip-off: 13 hauled up | Daily Express Online, Sabah, Malaysia. 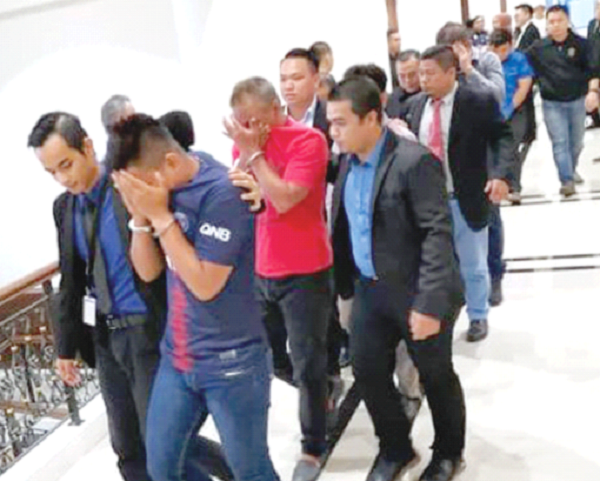 KOTA KINABALU: Thirteen directors of several contractor companies were remanded for three and five days to facilitate investigations into submitting false documents to get tenders worth millions of ringgit from the Sabah Education Department. Magistrate Mohamad Aizat Abdul Rahim granted the remand order applied by Investigating Officer Mohd Faliq Basiruddin from the Malaysian Anti-Corruption Commission (MACC) on Tuesday. The suspects comprising 10 men and three women. The men were remanded for five days while the women three days. According to Mohd Faliq, the suspects in their 30s and 60s, were remanded to assist into investigations under Section 18 of the MACC Act 2009 and punishable under Section 24 (2) of the same Act, which carries a jail term of up to 20 years, or a fine, of not less than five times the sum. He added that the contractors would be investigated for submitting false documents in order to get the tender worth hundreds to millions ringgit since 2016. The suspects were picked-up on Monday in Kota Kinabalu, Kota Belud, Kuala Penyu and Ranau. In TAWAU, the Magistrate’s Court saw three women and two men remanded for a week to assist in the investigations and for making false bank statements to supply meals worth RM8.8 million to four school hostels. The suspects aged 35 and 65, who were owner and manager of several companies, were detained in separate locations on Monday. Magistrate Herlina Muse granted the application by MACC Investigating Officer Johari Lahat. In KENINGAU, four company owners and managers were remanded for a week also for submitting false bank statements to supply meals for school hostels in Keningau and Nabawan. The four aged 37 and 52 were detained by MACC, after being suspected to submit the fake documents to the State Education Department for the tenders of supply meal to the students in hostels. MACC Investigating Officer George Merill applied for the remand order before Second Class Magistrate Ahmad Shah Tan Sri Sunuh at Keningau Hosipital as one the suspects was hospitalised. In LAHAD DATU, Magistrate Ryan Sagirann Rayner Jr granted a week’s remand order to two managers of companies suspected to be involved also in submitting false documents to the State Education Department.